Open Access Week is an international event for more than 10 years and it is an opoortunity for the scientific community to discover and discuss issues and potentiels of Open Access. 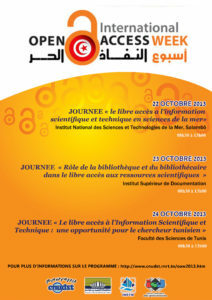 In 2012, tunisian participation in this event has been initiated by the CNUDST. Since 2013 national editions of OAW have been organized in open collaboration with some universities and research institutions at the national scale.